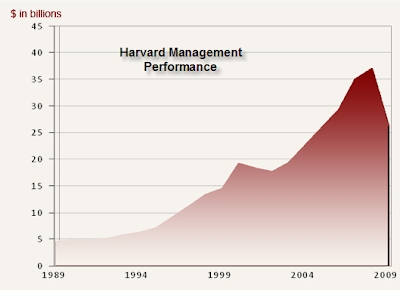 As predicted back in July, Harvard's Management's performance, which they have recently released, shows the endowment significantly down. For the 08-09 academic year (which is how endowments tend to measure performance) they are down 27.3%, bringing their 5-year annualized return to 6.2%. iShares 7-10-year US treasury ETF's (IEF) annualized return was 6.4% over the same period. Except one doesn't need a highly overpaid staff to manage a portfolio of medium-term maturity bonds. 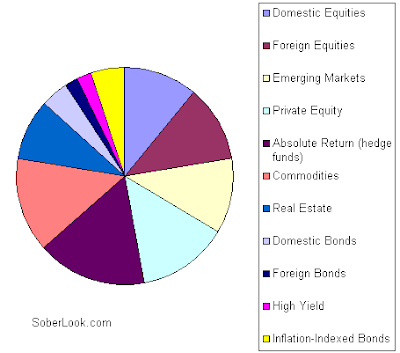 Here is the latest asset allocation of Harvard's portfolio. It surely will do well given the current market euphoria, until the next time.